When the UVZ factory in Nizhniy Tagil first began to work on a new medium tank design in the mid 1950s, one of the things they tried to introduce was a rubber-bushed cast steel track which would run quieter and smoother, both enhancing its lifespan and making operating conditions for the crew a bit better. While the tank prototype was not accepted - Article 140, the grandfather of the T-72 – the tracks eventually were and began being fitted to the T-55 and T-62 in the early 1960s. 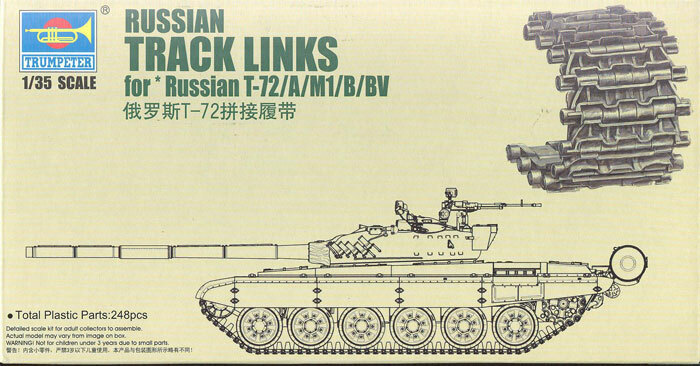 When the actual T-72 prototype (Article 172M) came out in 1968, it was also fitted with these tracks. Dubbed RMSh (rubber-metal hinged) by the Russians, they remain in service to the present day, but are now being replaced by the UNSh “universal” twin-pin track. RMSh tracks are a single-pin “dead” track design (dead means it simply lies there; a “live” track will try to curl up and this maintain better tension when installed) that can be used with either open (T-54/T-55/T-62) or suspended (T-72/T-90) types of drivelines – e.g. without or with return rollers. This set is basically the same one provided with the Trumpeter T-62 Model 1972 kit (No. 00377). It is not a bad set but is missing the quite prevalent “socket” appearance of the pin cup on the end of the hinge. While most modelers will probably be happy to use them as is, diehards will have to countersink the pin cup with a Dremel to get the right look. But they are easy to use and quick, so anyone wanting single link tracks should consider them for a project. Overall this isn’t a bad set and with some TLC can be quite good.